145 years and counting at The corner of Pine and Third! Thank you for visiting. Our Vision: To live by Faith; To be known by Our Love; To be a Voice of Hope. Our prayer is that you will be blessed and strengthened by the power of Jesus Christ and that you will live a life of abundance in fellowship, joy and liberty. We are a fellowship of believers coming together to declare the glory of the Lord and celebrate Jesus as King. We study the Word, practice what we learn and in the process, grow together. May God richly bless you! First Baptist Church: where you're a stranger only once. 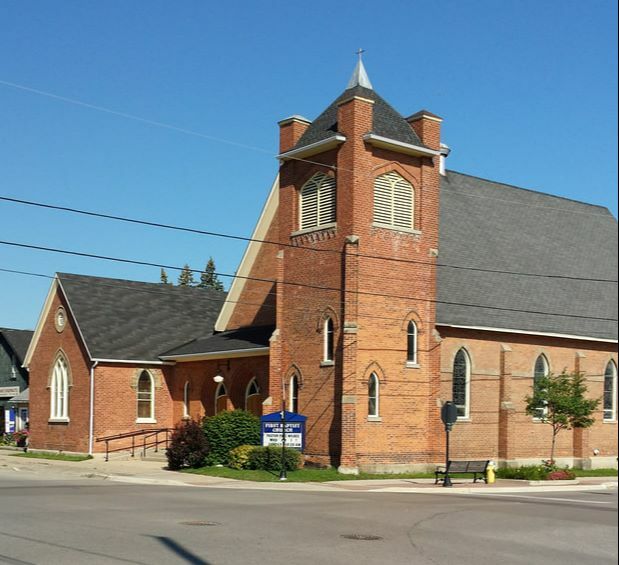 The family at First Baptist Church in Collingwood extends a warm welcome to everyone to join us on Sunday mornings at 10:30 at 160 Pine Street. Pastor Paul Wilkes is our spiritual leader and has brought a renewed spirit of peace, joy and love to us and is leading us to focus our energies on increasing our outreach into our community. In past months, First Baptist has provided both financial and spiritual support to a variety of groups and organizations as part of our mission, and in the months ahead, we will be presenting more musical concerts and special events. We are also proud to have celebrated our 145th Anniversary last September 23 as we looked back to the founding members of First Baptist who held their first organizational meeting in a stable. Each week, Pastor Paul brings us messages filled with Bible teachings, wisdom and practical life skills, and we are blessed as from time to time, he shows us his musical skills at the piano, the organ and his trusty accordion. DID YOU KNOW? We are wheelchair accessible and can provide the latest in hearing-assisted devices. Just ask one of our ushers.